Come With Me Behind The Scenes of Ralph Breaks The Internet. Back in July, I was in Los Angeles on a trip down the red carpet for Disney’s Christopher Robin. 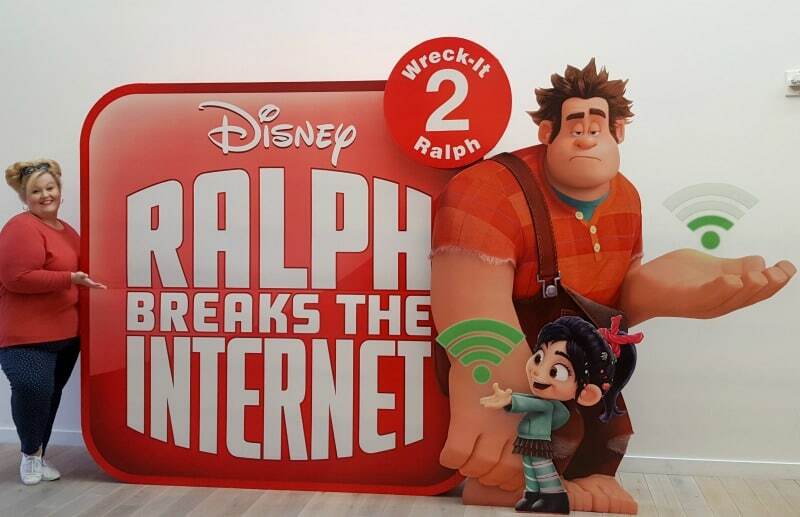 While I was there, I learned all about how Disney was creating Wreck It Ralph 2: Ralph Breaks The Internet. Going behind the scenes and diving into the thoughts of the creative minds behind a great Disney Film is always a highlight of any press trip. I’m always curious about how these stories and characters develop and how they remain true to the original characters and story line. 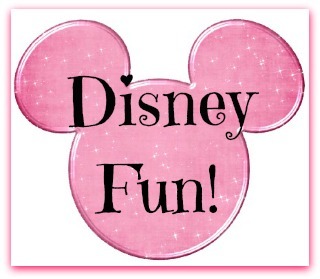 This is not an easy task and Disney has the best people in the world working on their films. Getting to hear how they got from pencil sketches to millions of characters in this film is fascinating, to say the least. RALPH BREAKS THE INTERNET: STORY – Storyboard artists at Walt Disney Animation Studios work closely with the director, heads of story and screenwriters to transform words on a script page into a visual representation—for example in this scene that showcases Ralph and Vanellope’s arrival to the internet. Storyboards are edited together with scratch or temporary dialogue, providing filmmakers with an early idea of how a scene might play out. ©2018 Disney. All Rights Reserved. Ralph Breaks the Internet: LIGHTING – Lighting is among the final stages of shot production in animation, though the lighting department is integral to the look of the film as production gets underway. Lighting artists can place individual lights within a scene, but for a scene as big as the one in which Ralph and Vanellope visit the internet for the first time, technology is utilized to place multiples of similar lights—like those on a building, for example—creating a more efficient process for dealing with a massive and diverse number of light sources. ©2018 Disney. All Rights Reserved. The Web’s Wide World was exciting to learn about. We had the amazing opportunity to sit down with Matthias Lechner (Art Director, environments), Larry Wu (Head of Environments) and Ernie Petti (Technical Supervisor) and hear about the daunting task of turning the abstract concept of the internet into a complex, thriving metropolis. Sites such as Ebay, Amazon, Youtube, and Yelp had to be turned into actual places where the people who lived in and visited the internet could go and shop, hang out, or look for information. 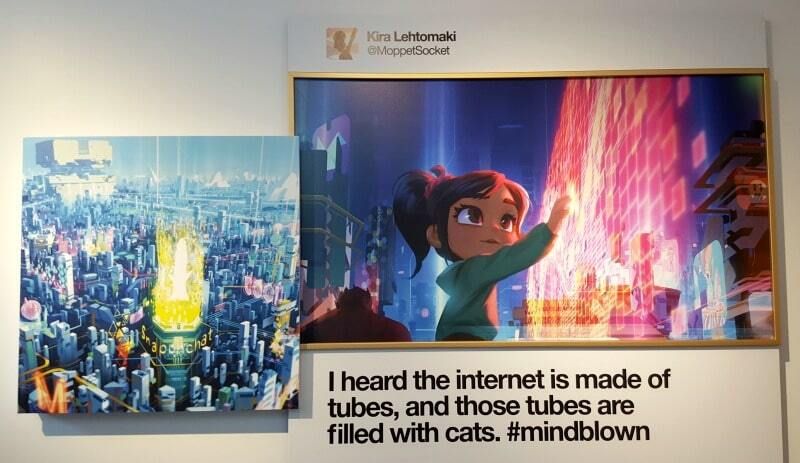 These were places where Vanellope and Ralph would visit during their adventures inside the internet. 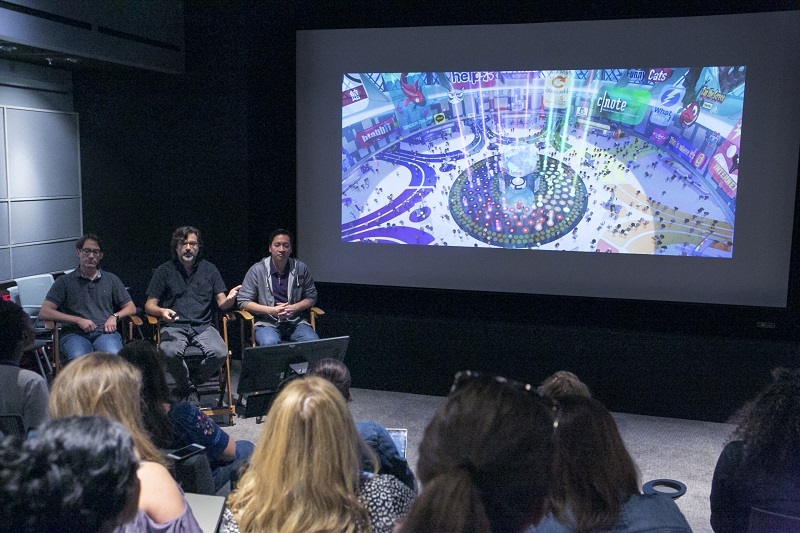 Technical Supervisor Ernie Petti, Art Director, Environments Matthias Lechner and Head of Environments Larry Wu as seen at the Long Lead Press Day for RALPH BREAKS THE INTERNET at Walt Disney Animation Studios on July 31, 2018. Photo by Alex Kang/Disney. ©2018 Disney. All Rights Reserved. 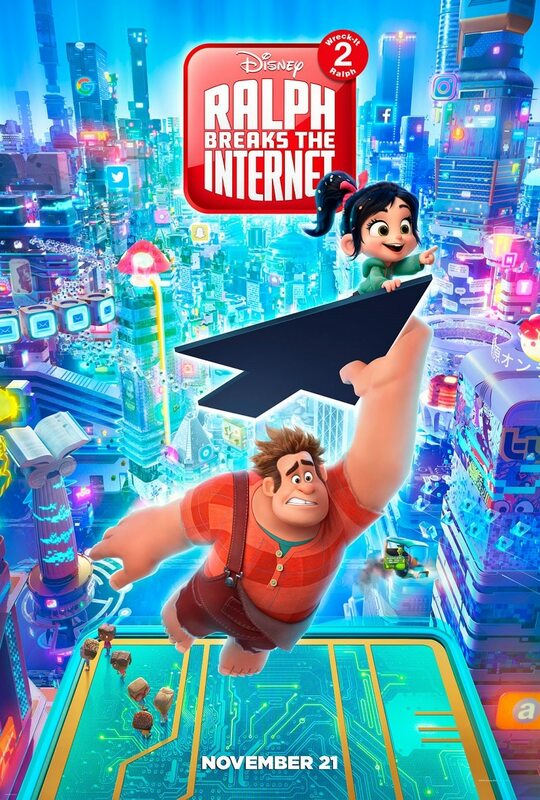 How, exactly, did Ralph break the internet though. This is the question that has been on my mind since I found out there was going to be a second Wreck It Ralph. Would he pull the plug on it all or just break a few vital pieces? Would it get fixed? These are questions that we’re going to have to save for when we see the movie! Everyone we talked to was super secretive about those details of Ralph and Vanellope’s adventures. We learned about the story download from Josie Trinidad (Head of Story), Jason Hand (Story Artist) and Natalie Nourigat (Story Artist), as they explained the unique roles that the story team played not only in developing a new adventure for Ralph and Vanellope, but also in envisioning the ever-evolving world of the internet. 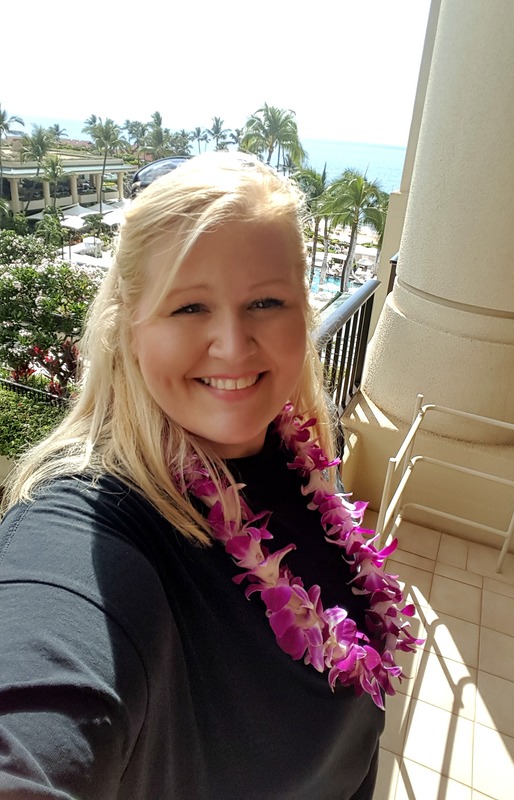 This was not a task they took lightly, but they shared how much fun it was to develop a new adventure with the day-to-day changes in the internet. The bar was set very high since the first Wreck It Ralph turned in the highest opening weekend ever for a Walt Disney Animation Studios film at the time of release back in 2012. This made the adventure that much more important. Using the world wide web certainly kept every possibility open that they could imagine. Head of Story Josie Trinidad, Story Artist Jason Hand and Story Artist Natalie Nourigat as seen at the Long Lead Press Day for RALPH BREAKS THE INTERNET at Walt Disney Animation Studios on July 31, 2018. Photo by Alex Kang/Disney. ©2018 Disney. All Rights Reserved. Where would we be without a population inside the internet? We talked with Cory Loftis (Production Designer), Dave Komorowski (Head of Characters and Technical Animation), Renato dos Anjos (Head of Animation) and Moe El-Ali (Crowds’ Supervisor) who explored the process of creating the inhabitants of the internet, from the “Netizens” to the “Net Users”. Head of Animation Renato dos Anjos, Production Designer Cory Loftis, Crowds Supervisor Moe El-Ali and Production Designer Dave Komorowski as seen at the Long Lead Press Day for RALPH BREAKS THE INTERNET at Walt Disney Animation Studios on July 31, 2018. Photo by Alex Kang/Disney. ©2018 Disney. All Rights Reserved. Netizens came about as they knew they needed people to carry out the day to day chores and work that was going on inside of the internet. The netizens “live” inside the internet and carry out the jobs of delivering emails, shopping (online), searching for answers, etc. These are the animated humans that turn our digital tasks into work. Netizens character visual development lineup by Cory Loftis (Production Designer) ©Disney. All Rights Reserved. Net users, on the other hand, are the internet version of the people using the internet. These are the cartoon incarnation of the people on the other side of the screen. User character visual development lineup by Cory Loftis (Production Designer) ©Disney. All Rights Reserved. 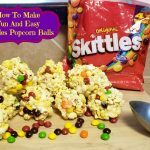 Yesss is a living algorithm for Buzztube. I bet you can guess where that name came from, huh? Yesss is always up to date on the latest trends and fashion. She helps Ralph and Vanellope along their journey through the internet to save the game and their life in the arcade as they know it. Video-game bad guy Ralph (voice of John C. Reilly) and best friend Vanellope von Schweetz (voice of Sarah Silverman) leave the comforts of Litwak’s arcade in an attempt to save her game, Sugar Rush. Their quest takes them to the vast, uncharted world of the internet where they rely on the citizens of the internet—the Netizens—to help navigate their way. Lending a virtual hand are Yesss (voice of Taraji P. Henson), the head algorithm and the heart and soul of the trend-making site “BuzzzTube,” and Shank (voice of Gal Gadot), a tough-as-nails driver from a gritty online auto-racing game called Slaughter Race, a place Vanellope wholeheartedly embraces—so much so that Ralph worries he may lose the only friend he’s ever had. Directed by Rich Moore (“Zootopia,” “Wreck-It Ralph”) and Phil Johnston (co-writer “Wreck-It Ralph,” “Zootopia,” writer, “Cedar Rapids”), and produced by Clark Spencer (“Zootopia,” “Wreck-It Ralph,” “Bolt,” “Lilo & Stitch”), “Ralph Breaks the Internet” hits theaters on Nov. 21, 2018.